Let’s face it, at this point in 2015, there are not very many unique techniques left that can be employed to get athletes faster. In this article, I’m going to introduce and discuss one that I hope is still relatively unknown in the arena of speed development. The method is referred to as “Deficit” training utilizing the hex bar (aka trap bar). Incorporating a deficit can serve as a progression for athletes and perhaps emphasize better development of specific speed related qualities. I will elaborate on these qualities below, as well as provide you with a video demonstration of the actual exercise. But first, I want to quickly define what a deficit is for those who are unfamiliar. A deficit is simply an increase in the height of standard lifting surface. Examples would be performing conventional pushups off of two medicine balls, or deadlifting while standing on a 45 lbs. plate, etc. The elevation naturally increases range of motion and time under tension. Hopefully, it’s no secret at this point that the hex bar deadlift variation is of extreme value for athletes looking to get faster. Here is a classic study compliments of Jim “Smitty” Smith that examined the effects of the hex bar and straight bar deadlift variations on a group of elite powerlifters. What the researchers ultimately found was that power production was greater with the hex bar than the straight bar. Moreover, lumbar spinal stress was lower than with the straight bar. Now I’m in no way saying that the straight bar is not useful for an athlete, because it is. Barry Ross has had huge success using this exercise with his athletes and making them faster throughout the years. I also admire the hell out of the powerlifting culture and there amazing and unparalleled feats of strength. With that being said, I will always follow scientific research, and in the context of strictly “speed and athletic” development we have to give the edge to the hex bar. 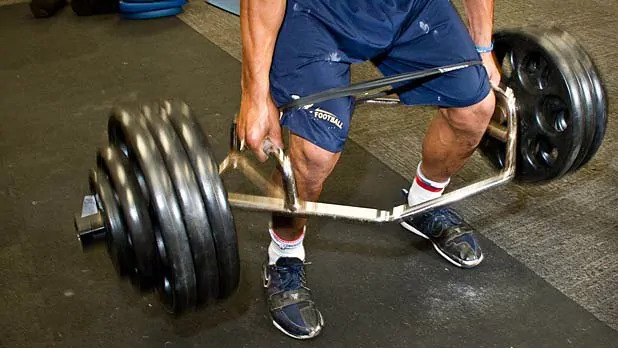 Power has been identified as the most important element for achieving higher running speeds and the hex bar does the absolute best job in satisfying maximal development of this skill out of each type of deadlift. 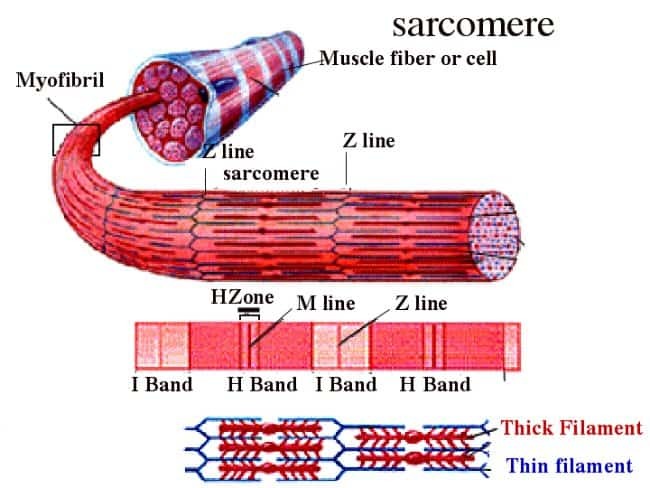 Sarcomerogenesis is the formation of new sarcomeres within a muscle tissue which can lead to increased muscle growth. Research supports this process when we operate under a heavy workload with the target muscle in a very stretched position. When you examine the amount of pre-stretch that occurs to the glutes and hams at the bottom position of the video I shared, it’s easy to see how the exercise could stimulate sarcomerogenesis. Try to say that last word 5 times fast. Anyways, we can classify strength exercises depending on how long the muscle becomes during the duration of the movement. Short-Length Exercises: i.e. hip thrusts, board presses, sled training, etc. These movements involve very little stretch before contraction occurs and focus on building strength in the end range of an exercise. Medium-Length Exercises: i.e. squats, chins, military presses, etc. These movements involve a moderate degree of stretch before contraction occurs and are the most common in athletic movement and training. Long-Length Exercises: RDL’s, Dumbbell presses, Deficit work, etc. These movements involve the highest degree of stretch before contraction occurs. …. which relates the process of sarcomerogenesis to the act of sprinting specifically. He discusses all kinds of mechanisms and physiological reasons for why this adaptation is critical to speed athletic success. With increased ROM (Range of Motion) and TUT (Time Under Tension), you will naturally enable more of a growth stimulus with this specific exercise. Cross Sectional Area, or the size of a muscle group is another foundation principle to athletic and speed success according to research, so this can only be good for the athlete in question. Months back I reviewed a scientific review article, compliments of Brad Schoenfeld which demonstrated that movements with more ROM will elicit higher degrees of subsequent muscle growth than shorter ROM exercises. This is not to say that “partial” range of motion exercises are not valuable because they undoubtedly are. They help strain the Central Nervous System which may lead to strength improvements and adaptation, they develop “lockout” function which many struggle with and more. We are just talking hypertrophy here. The general theory behind increased ROM creating greater muscle growth deals with a greater eccentric phase leading higher levels of muscular damage. Which in turn causes of overcompensation of growth to help protect against future threats against the target tissue. Lastly, deficit work is very exhausting when performed correctly, and metabolic fatigue is also a major precursor to activating muscle growth responses in the human body. This one is pretty obvious I think. If you analyze the muscle and joint actions between a block start, football start, and the deficit it’s easy to see there is a lot of similarity between them all, which would allow for greater transfer between each. All of these skills rely on Starting Strength Capacity. This is the ability to generate maximal force production without the aid of the SSC (Stretch Shortening Cycle) or Stretch Reflex. In other words, you are priming the neuromuscular system to be able to generate as much force as possible with absolutely zero momentum throughout the concentric phase of the movement. This is often referred to as that explosive first step which everyone is so desperately trying to improve in athletics. Deficit training is not the only type of exercise to improve start and first step function but it will certainly help. Swinton, PA. A biomechanical analysis of straight and hexagonal barbell deadlifts using submaximal loads. Journal of Strength and Conditioning Research, 25: 2000-2009, 2011. Zollner, AM. Stretching skeletal muscle: chronic muscle lengthening through sarcomerogenesis. PLoS One, 2012.